Parents are requested to contact the school office by telephone or e-mail on everyday of absence. Failure to do so results in an unauthorised absence, which is noted in the register. Regular attendance is critical for children to be successful and benefit from the learning opportunities presented to them at school. It is a fact that at Hamstreet Primary, the poorest attenders make the poorest progress. Some parents assume they are allowed to take their child out of school for a family holiday. This isn’t true. Government regulations state if you take your child is out of school during term time, leave will not be granted and it will be recorded as unauthorised absence unless there are exceptional circumstances e.g. family bereavement. Also, if your child is absent due to illness, we will now require some proof of medical evidence to confirm the absence. Examples include; a copy or sight of the child’s prescription, an appointment card from the surgery or dentist, a note from the doctor’s surgery or pharmacist. 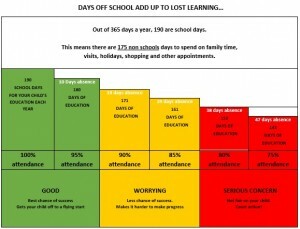 If your child has poor attendance, we may ask for an Education Welfare Officer (EWO) to investigate what is happening. Parents and carers have a vital role to play and a legal responsibility to ensure their child’s regular attendance so please help us in the drive to improve overall attendance. Thank you.